Detroit’s streets are changing, and it’s a beautiful thing to witness. 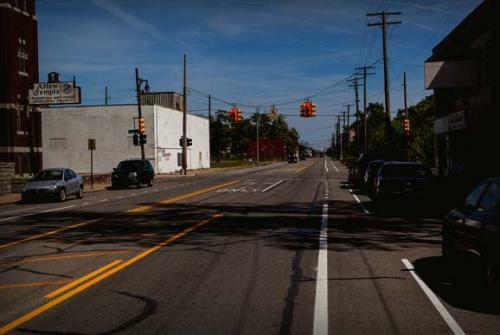 Despite its recent bankruptcy, thanks to the help of philanthropic institutions in the area, the Motor City is moving to repair some of the damage that’s been done by decades of promoting the speed of cars over the health of neighborhoods. Cyclists on Detroit’s East Side have a reason to celebrate this month. Right now, the city’s Department of Public Works is in the process of laying down bike lanes on Kercheval that will ultimately stretch from Grand Boulevard to St. Jean. Part of the route has already been set down and the rest is expected to be completed by the end of construction season. The Kercheval bike lanes are pretty basic, consisting of pavement markings and associated signage. When completed, they’ll cover about four miles total, two on each side of the road. Prasad Nannapaneni, a traffic engineer with the City of Detroit, says the new Kercheval bicycle route is intended for both transportation and recreation, adding that it’s a segment of a larger undertaking. “These new bike lanes will provide connection between Belle Isle and 8 Mile road (part of [the] Governor’s showcase trail from Belle Isle to Wisconsin),” he told Mode Shift in an email. Currently Detroit has 68 miles of bike projects. This includes 38 miles of bike lanes on city streets and five miles of bike lanes on MDOT streets, 10 miles of signed routes, and 15 miles of off road paths, according to Nannapaneni. Altogether his department is planning to add about 50 new miles of bike lanes this year. In addition to the Kercheval lanes, the city is putting down 19.5 miles on Grand Boulevard from River Park to Belle Isle, 10.5 miles on Oakman Boulevard from Tireman to Highland Park’s city limits, 4 miles on on Lafayette between I-375 and Grand Blvd, 2.8 miles on Forest between Dequindre and Cadillac, 3.7 miles on State Fair between Woodward to Dequindre and 3 miles on St. Jean/ Shoemaker/Conner between Mack and Harper. Elsewhere on the Network today: Encouraging news from Beantown, as Boston Streets reports that eight mayoral candidates turned out to a recent campaign forum hosted by advocates for sustainable transportation, i.e. “the bike lobby.” Meanwhile, Rebuilding Place in the Urban Space remarks on the tension between city dwellers’ desire for more commercial amenities and their reluctance to welcome new people into their neighborhood to support those businesses.